Today is all about the amazing Ms. Bernie Berlin. Bernie is a gifted artist. She creates Faberge style eggs, teaches mixed media classes internationally and has written the quintessential book on Artist Trading Cards. Beyond those impressive credentials, Bernie is a shining beacon of light in an oft times dark world. Bernie runs an animal shelter called A Place to Bark (and meow). 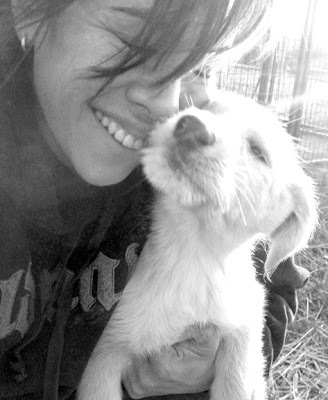 She rescues over 5oo dogs every year, rehabilitates them and takes them to Chicago to be adopted to loving families. She takes in the dogs who would ordinarily be euthanized, nurtures them, heals them, loves them and literally changes their lives. She assists in raids on puppy mills where dogs are imprisoned in cages and forced to keep producing puppies, never walking on the good earth, never seeing the sun, never knowing the soft touch of a hand gently patting their fur. She's seen the worst of human behavior and greed, and countered it with compassion and infinite unconditional love. That is the point my friends. That's why we're here. Bernie needs our help. She's lost funding and food sources and she's got a shelter that needs to be finished and dogs that need surgeries and food and rescuing. Without our donations, she can't continue building her dream. She's asking for 10 dollars from each of us, and for us to ask our friends and family to consider joining her fight. Please repost this information and visit her blog so you can place her widget in your blog or website to help spread the word. I've never met anyone like Bernie Berlin and I am so deeply blessed to call her my friend. You can follow this link to donate. What's 10 dollars, really? It's a single movie ticket, it's a download on NetFlix, it's a dinner at a fast food chain...it's money we spend so quickly we can't remember where we spent it. So why not spend it somewhere that matters? Bernie isn't just a crafter, she's crafting hope. We need as much of that as we can get these days. I love Bernie and what she does! I'll link this for sure! Thanks Margot!